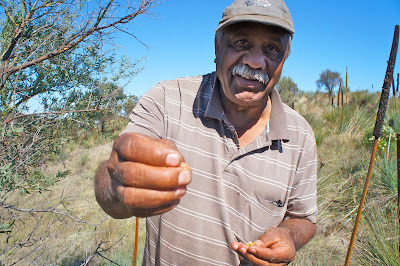 Not everyone can convince an RSPCA representative to eat a wild possum, but Leon Colson, an Aboriginal elder who lives in the far northwest of South Australia in the Anangu Pitjantjatjara Yankunytjatjara (APY) Lands, did just that. While visiting Bendigo last year, Colson’s son had a craving for the much-loved marsupial. As the pair was roasting possum stuffed with bush tomato and basil over a campfire, the police arrived accompanied by the RSPCA. They had Colson on camera whacking a protected species over the head, although he believes the tantalising aroma of his dinner is what alerted them to his cooking. As usual, Colson’s wit was sharp, “You’ve got it all wrong mate,” he told the officials, “I’m the only endangered species around here!” The man from the RSPCA recognised Colson’s ngulu, customary dreadlocks wrapped in red string that signify his status and heritage. Traditional law overrides statute law. The pair was left to eat their meal in peace, but not before the man from the RSPCA had sampled some of Colson’s possum magic himself. Colson’s head holds centuries of wisdom, and yet there’s not a single gray hair hiding in his ngulu. His secret — ladies and gents take note — is tea tree oil and reduced emu fat. He is constantly chuckling, revealing gaps where teeth were knocked out during initiation ceremonies. When he laughs, his grin spreads across his whole face and his eyes narrow to thin slits. It makes it even more difficult to determine the colour of his irises, which fluctuate between slate grey and hazel depending on his mood. Colson attributes this interesting phenomenon to Wanampi, the Rainbow Serpent from which he takes his Aboriginal name. 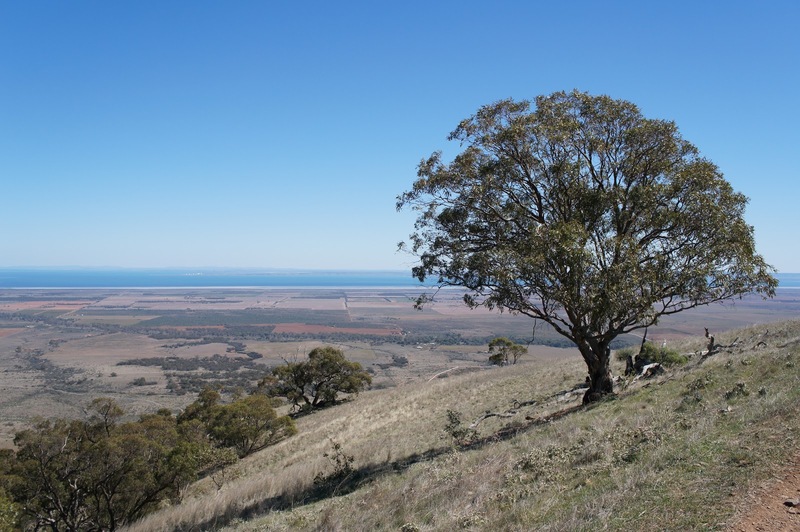 Driving in Nukunu country, about three hours north of Adelaide by car, we discover Colson is fluent in 12 indigenous Australian languages, excluding English. This gives him the ability to share his knowledge about native flora and fauna with anyone who is interested. He doesn’t discriminate between those who deserve to learn about his world and those who do not. 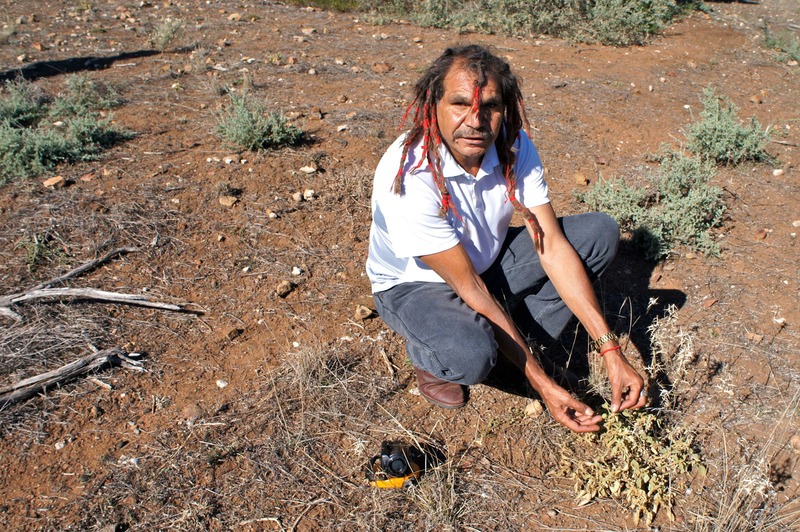 He has lectured at universities and has given talks to organisations about his culture, but back in Nukunu country, it’s clear he is most comfortable on the land. 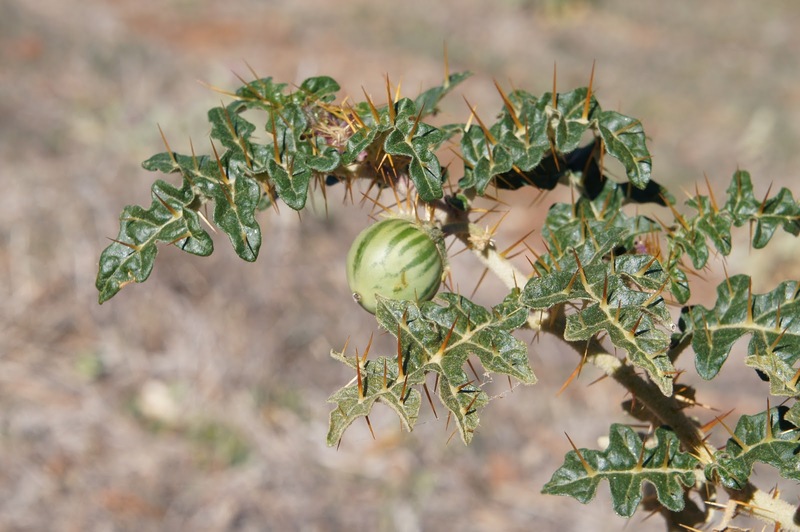 “Bush tomato!” he announces proudly as he parts the wide, decorative leaves of a small shrub. A few steps away he points out another variety; the leaves are duller and much narrower than the previous plant. Its small purple flowers are an enticing warning. “Don’t go near those ones,” Colson cautions, “they’ll make your belly sick.” Later, as those of us unfamiliar with the land struggle to navigate between scratchy shrubs, Colson floats over to a brush mistletoe and delicately prises a cluster of berries from a low branch. Some are deep red, others are canary yellow, but all pop in the mouth like miniature, ripe persimmons. In a non-indigenous world, we are taught from a young age never to eat wild fruits, should they be poisonous. This overprotective way in which we exist relative to the environment has created a disconnect between nature and ourselves. Perhaps this is why observing something so natural, like Colson pausing mid-stride to pluck a crimson berry from the ruby saltbush, is so enchanting. It’s only once he points out the tiny red jewels that you realise the bushes are abundant, even though farming and overgrazing have degraded this part of South Australia since colonisation. 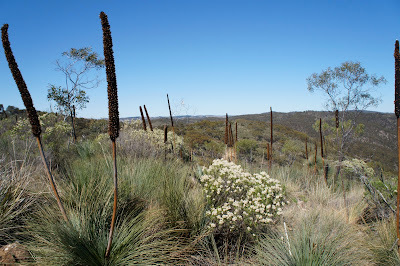 Most of the trees have been cleared, and unlike saltbush, they take decades to grow back. Since colonisation, farming practices and introduced species have tarnished the land, but cooperation between indigenous and non-indigenous groups can rejuvenate it. 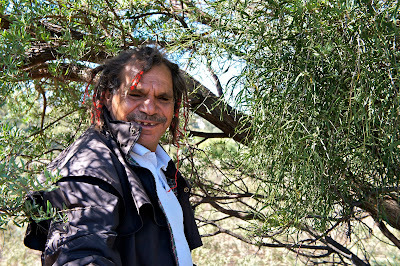 Non-indigenous Australians can learn a lot from Aboriginal groups about the natural Australian environment, according to Joe Morrison, CEO of one of the most successful caring for country organisations, the North Australian Indigenous Land and Sea Management Alliance (NAILSMA). “Indigenous knowledge is a fundamental plank to any robust management of national resources. The work that we do and we advocate for in terms of community-based rangers and keeping people on country is the way that will be achieved,” says Morrison. But since European settlement, the ability of rich, Aboriginal culture to be passed down has been inhibited. Thankfully, some passionate individuals spend their days reviving old knowledge. Colson is one of these people. He has made it his mission to be a cultural rehabilitator. Not only does he share his expertise with universities and organisations, he also travels to indigenous communities across Australia to remind them what it means to be Aboriginal. He re-teaches them what is rapidly becoming a dying tradition. Colson has spent time with Aboriginal groups in Victoria, who have watched in disbelief from shaded camping chairs as he forms a spear from a branch and uses it to catch his dinner. He has taught indigenous people who are used to watching Bear Grylls on satellite television how to create shelters from plants and live off the land. But Colson is only one person, and regrettably, modern living and industrialism is killing off biodiversity, bush tucker and traditional knowledge. The key to preserving Mother Nature’s secrets lies in preservation, cooperation and a willingness to learn. Increasingly, young Aboriginal people are turning their attention to game consoles and English education systems, while the elders — living, breathing stores of information about our natural world — are only growing older. Colson might be only one person, but he is not alone. “Pull over” demands Aboriginal elder Douglas Turner, already half way out of the dusty white four-wheel drive. He disappears over the edge of the bumpy road and down the other side of what seems like a sheer drop. Colson follows leisurely behind, smiling. Greening Australia Vegetation Consultant, Mick Durant, shrugs his shoulders as he yanks the handbrake and pulls himself out of the car after the others. Turner has the familiar, comfortable aura of a favourite grandfather but is startlingly agile on his land. While Colson admits he gets a kick from watching people cower when they see his ngulu dreadlocks and ‘wild’ appearance for the first time, everyone who meets Turner has to fight off the urge to hug him. His thick, silver moustache – constantly tilted upright at the corners in sync with his unyielding smile – stands out beneath his faded brown Jarvis Walker fishing cap. “Here,” offers Turner, holding a foreign object between his thumb and forefinger, “it’s an acquired taste.” He thrusts a translucent golden nugget of dried sap into open palms, then turns back to the bark of a native silver wattle, prying more gum from the trunk for himself. There’s a hit of sweet honey followed by an earthy tartness; nature’s salted caramel. “We used to chew it when we went out bush as kids,” he says. Back in the car, Durant’s vegetation-measuring equipment competes with bums and old banana skins for space in the back seat. Buckets for collecting seeds, measuring tapes and tools fill the boot. We scrape at our teeth, which are jammed together with sticky sap, while listening like attentive children to Turner and Colson as they bounce off each other and talk about the native flora. Individual yacca plants stand to attention on the side of the road like comical trees from a Dr. Seuss picture book. The vertical spears jut from leafy skirts and give way to brush-like heads. Turner instructs us how to craft them into fishing spears, but his eyes light up as he recalls indigenous footballers pausing to drink the nectareous water from the hollows of the plant after tackling hill sprints. Energised by Mother Nature’s Red Bull, they would run all the way back into town, barefoot. We continue to bump along the rough track through the mountains of Baroota, holding onto the handlebars on the car roof, our stomach muscles tightened. Suddenly, we are hit with the unmistakable stench of curry through the open windows. It’s a clear, 27-degree day and the heat gives the air’s spicy perfume an almost tangible quality. “Curry bush,” Turner says knowingly. “Cassinia Laevis,” offers Durant, who is always wearing his scientific cap. Heating this native plant will kill the remarkable scent, but Colson assures us it can be used as a respiratory remedy, which is why it is also known as cough bush. Down the bottom of the track, the land pancakes and you can see across the Spencer Gulf to Whyalla. The water in the distance is so blue it’s almost blinding. We get out of the car to take in the scenery, rub our backsides and wait for the others in the car behind us. “Do you want a cappuccino?” asks Lindsay Thomas, another respected Nukunu elder who is part of the convoy. He would certainly fit into the Melbourne coffee scene with trendy, rimless sunglasses that barely cover his eyes and a sharp haircut. But the blue cargo pants would probably go unnoticed, as would the black printed t-shirt with the slogan “healing spirit” plastered across a yellow Australia stencil that overlaps a red circle, a take on the Aboriginal flag. “Do you want a cappuccino?” asks Thomas again. We are standing in an arid landscape dominated by prickly shrubs and native grasses. Either Thomas is a mind-reader or we’ve misheard the question. He plucks a dried seedpod from the elegant wattle next to him. “You roast seeds from the tree, crush them in a mortar and pestle, and you’ve got a cappuccino,” he replies matter-of-factly (it’s decaf, of course). 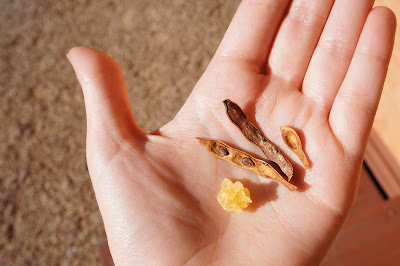 But that’s not all the seeds are good for; they have also successfully suppressed skin cancer cell development in mice. Research is underway with the hopes that similar results will be obtained in humans. The amount of information absorbed in a single day driving around country with the Nukunu people is a testament to Aboriginal knowledge. These people are walking archives of native flora and fauna, and to say their inherent database is enviable would be an understatement. Every leaf has nutritional or medical value, each stem and branch a practical use. Article 24 of the United Nations Declaration on the Rights of Indigenous Peoples reads, “Indigenous peoples have the right to their traditional medicines and to maintain their health practices, including the conservation of their vital medicinal plants, animals and minerals.” Indigenous Australians have recognised the therapeutic benefits of native lemongrass for centuries. Yet in 2010, researchers from Griffith University ‘discovered’ its use as a natural aspirin after a five year study. The report is scattered with medical jargon such as “platelets”, “serotonin” and “eugenol”, but as Thomas points out, Aboriginal groups simply know it works, because countless generations before them said so. That’s more than enough for them. Native Frangipani is beautiful Australian flowering plants with perfumed yellow flower, also called as Hymenosporum Flavum. You can have it in your gardens to have delightful look.